(Sub-Mariner #22 (1970) 1st App. Dr. Strange App-NO RESERVE Act Fast on this one! Check out the scans to get a better idea of the condition.). SUB-MARINER #1 MAY 1968 MARVEL COMICS FIRST ISSUE! ROY THOMAS JOHN BUSCEMA. MARVEL COMICS. FIRST ISSUE! Featuring the talents of ROY THOMAS, JOHN BUSCEMA, FRANK GIACOIA & SAM ROSEN. This item is a must have addition to any collection. (SUB-MARINER #35 PRELUDE TO 1ST APPEARANCE DEFENDERS CGC IT-NO RESERVE Act Fast on this one! Check out the scans to get a better idea of the condition.). 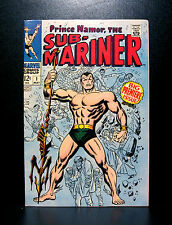 The fine item you are considering is a1967 Prince Namor The Sub-Mariner Submariner #1 First Issue Marvel Comic Book. This cool first issue from 1967 is in typical read and used condition, showing creasing on the front cover and typical yellowing, with a small area of staining on the back, but it’s still a solid reading copy. Cover Gene Colan (Pencils) Dan Adkins (Inks). ----- -- ------ - ---- - - ------------- ----from Marvel from 1969- --------------- - ---- -----------. (Sequence 1 - Story, 20 pages ). We will take great care in processing your order. Roy Thomas Story, John Buscema and Frank Giacola art, John Buscema and Sol Brodsky cover. Story continued from Iron Man and Sub-Mariner #1, Origin of Sub-Mariner Retold. CGC Universal Grade [Blue Label]: 7.5 VF-. Sub-Mariner Lot #2 #3 #6-13 Triton Tiger Shark Thing Serpent Crown GD-FN Range 10 Book Lot . I am not a professional grader; I have taken pictures to illustrate the condition of this lot of comics. 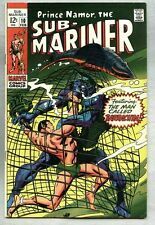 (SUB-MARINER #23 Marvel Comics (1970) 1st Appearance Of ORKA-NO RESERVE Act Fast on this one! Check out the scans to get a better idea of the condition.). We will take great care in processing your order. Sub-Mariner lot GD/VG #1 Premiere Issue & Origin, #5 1st Tiger Shark, &TTA #70! Submariner Lot of 3: Submariner #1 Premiere Issue and Origin (Cover has a tear, see Pictures), Sub-Mariner #5 1st Tiger Shark, and Tales to Astonish 70 where Hulk and Submariner begins. 3 great stories GD/VG or better. Cover is detached from book and taped together. Centerfold is detached at bottom staple. Cover John Buscema (Pencils) Frank Giacoia (Inks). ----- -- ------ - ---- - - ------------- ----from Marvel from 1968- --------------- - ---- ----------- ------ ----- -------------------- -- ----. It is very important to us. (SUB-MARINER #29 Marvel Comics 1970 Bronze Herculess app NO RESERVE Act Fast on this one! Check out the scans to get a better idea of the condition.). Comics are well kept in plastic sleeves by avid collector. Please see photos for conditions. Comic is complete with no cut or missing pages. All Orders Will Be Promptly Shipped Upon Receipt Of Payment. All Items Will Be Securely Packed, Bagged, and Boarded and sent between thick cardboard. Cover John Buscema (Pencils) Frank Giacoia (Inks)----------------- -------------------------- ------- --------------. Roy Thomas (Script), John Buscema (Pencils), Frank Giacoia (Inks), John Duffy (Letters). Grade: GD 2.0. Published 1968 by Marvel. Guest-starring the Fantastic Four. Written by Roy Thomas. Art by John Buscema and Frank Giacoia. Imperius Rex! Witness the startling origin of Prince Namor. Edit: April 9th, 2019 the scrape is best shown when case is viewed at an angle to a the light. Marvel SUB-MARINER #2 (FN) - "Cry... Triton!" Marvel SUB-MARINER #2 (FN) - "Cry. Triton!". It's in our professional opinion that this book is in FINE condition. It shows slight-to-moderate signs of aging with Off White/Tan pages that has slightly discolored art from age. Tales to Astonish #2,2,3,4,5 (SubMariner) F-VF Est. Grade! I am a lifelong collector of comics. The grade represented is my best estimate. 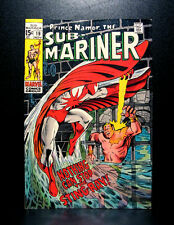 #2 (two copies) -Originally presented in Sub-Mariner (1968 1st Series) #2 - "Cry.Triton!". Guest-starring Triton. Written by Roy Thomas. Sub-Mariner 8 Vs Thing 1st Appearance Betty Dean Buscema Cover Marvel 1968 Comic. Shipped with USPS First Class Package. PRINCE NAMOR THE SUB-MARINER #2. TRITON BATTLES SUB MARINER. THIS COMIC IS PROFESSIONALLY GRADED BY CGC AS FINE / VERY FINE (7.0). 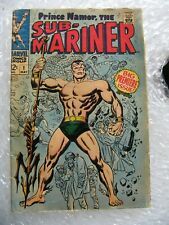 SUB-MARINER #9 1969 MARVEL "1ST APP. SERPENT CROWN" THOMAS/ SEVERIN VG. We will take great care in processing your order. Sub-Mariner 5. Great addition to your collection! Please check out my other auctions for more Silver Age Marvel Comics! I refer to CBCS grading guidelines. I am not a professional, I list what range I believe it’s in. Please refer to pictures for condition. Ships in a box for maximum protection. I treat your comics as you would treat them! I combine shipping. Each additional auction you purchase is just $1 for shipping. Just make your purchases and I will send an invoice with the reduced shipping costs. Thank you! 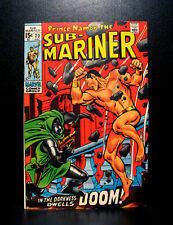 This item is Sub-Mariner #1 from May 1968. It is CGC graded 6.5(F ). (Check out the scans to get a better idea of the condition.). SUB-MARINER #18 1969 SUBBY VERSUS TRITON MARVEL SILVER AGE NICE! Nice Eye Appeal! It's The Coolest! 11 – 15 books 5.95. 16 or more books 6.95. Each book thereafter add 1.00. 6 - 10 books 4.95. ST book 5.00. From Marvel from 1983 ------------------- ---. Character appearances What if Destiny had Not Destroyed Atlantis?. It is very important to us. ------------ ----------------------------------- ------check out the pic for a great look------------------------------------------------------------------------------------------ - - grade vfn. Sub-Mariner #6 and #9 (Oct 1968, Marvel) 9.2 high grade. See pics. Up for sale is (1) 2 book set of high grade Sub-Mariner issues. #6 and #9 in 9.2 grade range. Sharpe corners and few flaws. Beautiful backs no dog ears. High gloss issues. Books are in new mylar bags with clear 60pt backer boards. Will be Gemini box shipped. Free shipping. Please see my feedback. Thank you for looking and feel free to ask any question. (SUB-MARINER #59 Marvel Comics 1973 classic NAMOR BATTLES THOR-NO RESERVE Act Fast on this one! Check out the scans to get a better idea of the condition. ).